This will make two thick pizza bases, or three thinner ones, strewn with broccolini, mozzarella and anchovies. Add sun-dried tomatoes, preserved artichokes, salami, blue cheese, but make the broccolini the star. Combine the yeast, sugar and warm water, stirring. Set aside for 10 minutes until it starts to foam. Put the flour and salt in a large bowl and make a little well in the centre. Add the yeast mixture and olive oil, gradually mixing in the flour with a fork, until it comes together. Turn out dough onto a floured surface and knead for 10 minutes until smooth and elastic. Brush with the extra olive oil, place in a bowl, cover with plastic wrap, and leave in a warm place for an hour or more until doubled in size. Cook the broccolini in simmering salted water for 3 minutes, then drain and refresh in cold water. Heat the oven to 220°C. Turn out the dough, flatten it, and cut in half. Roll out each half to no more than 1cm high. Place on two lightly floured baking trays, and smear with tomato passata. 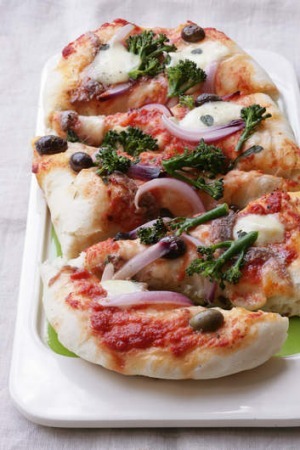 Strew the broccolini, mozzarella, red onion, anchovy, olives and oregano on top and bake for 10 to 15 minutes or until golden. Serve hot. Tip: For very fast pizza, use Greek pita breads for the bases instead, strew with the topping and bake at 180°C for 5 to 6 minutes.